Police cover the bodies of the two Korean brothers after their lifeless bodies were discovered on the street outside their hotel in Makati early this morning. 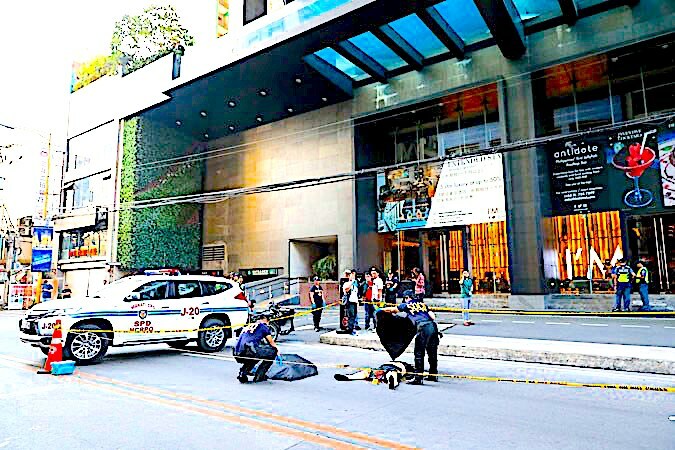 Police are investigating after two Korean brothers — said to be keen gamblers — fell to their deaths from the third floor of a Makati hotel. The pair were found dead in the street outside I’M Hotel, on the corner of Makati Avenue and Kalayaan Street, today (Friday, March 22) after patrolling police officers head a loud bang at about 5.45am. Chief Inspector Gideon Ines of the city police office has identified the brothers as Sanjing Kim, aged 38, and Sangjun Kim, 36. Another police source, Senior Superintendent Rogelio Simon gave the name of the younger man as Jang Jun, and said he was 35. Cf. Insp. Ines said the brothers died after falling from the third floor room where they were staying. He also said that investigators had not discounted the possibility that foul play was involved in their death. “We were told by the hotel staff that these brothers are always in casinos,” he said. Police are now checking the hotel’s CCTV footage to see if the brothers had received any visitors. The Korean Embassy has been contacted and are now coordinating with police. Should the deaths prove to be suicide, it would not be the first time a Korean gambler has taken his own life in Manila. In August 2017, we reported how a Korean hanged himself after losing nearly $400,000 in a Manila casino. The 38-year-old tourist was found hanged on the balcony of his room in a condo by a friend and Filipino driver. According to the Korean Yonhap News Agency, the driver told police that the man had lost 445 million won – nearly $400,000 – at a casino in the city.